Have you been on a vacation since your honeymoon? Spent a whole weekend just the two of you? Time alone as a couple is important for a healthy relationship. Even if you don’t have kids, it is hard to find time to truly concentrate on your relationship with all of the other distractions in your life – work, family, friends, pets. This is why a vacation at a couples resort is such a great idea. 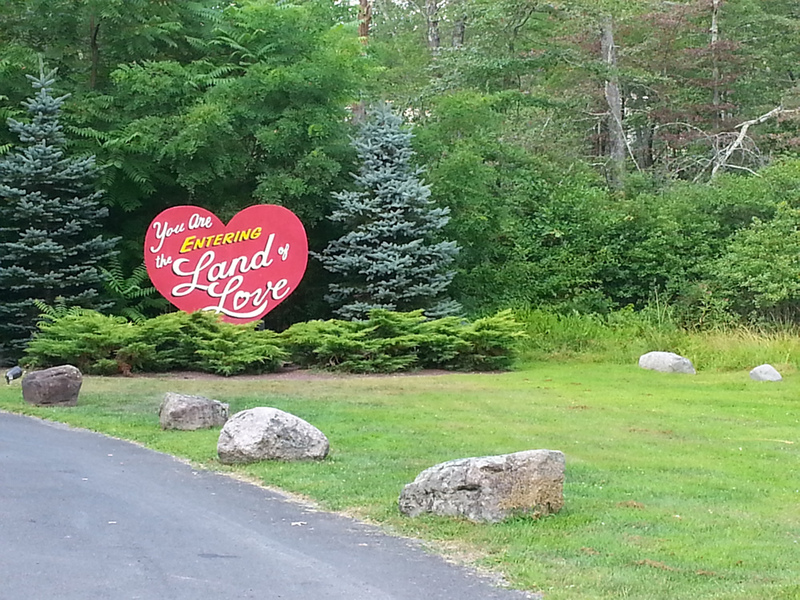 If you follow me on social media, you probably saw our photos from our recent trip to the Land of Love – Pocono Palace. Pocono Palace, located in Marshalls Creek, Pennsylvania, is one of 3 couples resorts owned by Cove Haven Entertainment Resorts. 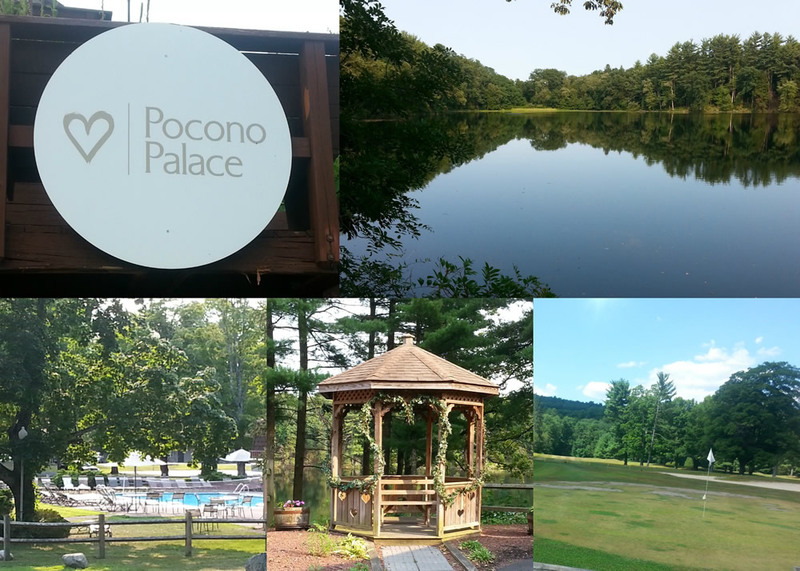 My husband and I were invited to stay at Pocono Palace so that we could share our experience with the Newlywed Survival readers*, and boy do I have a lot to share! Today, I will let you know about the romantic room and delicious meals we enjoyed. 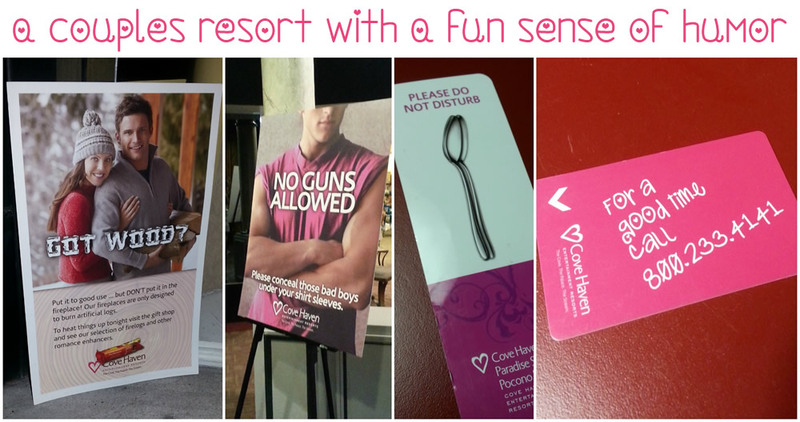 In the next post, I’ll tell you more about the activities and entertainment the resort has to offer. A great thing about this couples resort (besides the fact that no children are allowed), is that it is all-inclusive. For one price, you get a spacious suite, unlimited breakfast and dinner, indoor and outdoor recreational facilities and nightly entertainment. The only time we had to think about money was for tips, and alcoholic beverages. When we arrived at Pocono Palace, we were so excited to see our room. I had checked it out online and couldn’t imagine how they could fit so much into one room. How can you not feel romantic in a room like this? At night, we would sleep in our round king-size bed under the stars. The ceiling above the bed had little lights that looked like stars on a dimmer switch. These lights were also above the champagne glass tub! If you turn off all of the lights in the room, you have a nice dark room which allowed us to sleep a long time. After waking up at 10:30am, we decided to have a very late breakfast. As I mentioned before, breakfast and dinner are included in the package. We decided to make the best of this and try to eat tons at both meals and skip lunch. This was really easy with all of the wonderful food provided! Breakfast is a buffet. I’ll be honest, I am not big on buffets. I hate when all of the food gets cold and things sit for too long. I was really happy that this was not the case at Pocono Palace. Everything was hot, fresh and delicious. They also featured different mimosas, and I decided to have the peach one. A great way to start the day, don’t you think? The dinners were excellent. The first night was a buffet featuring numerous options including a carving station and a soup bar. My husband and I had never seen a soup bar like this before. You choose the items you want to include in your soup – chicken, vegetables, noodles, etc. and they add either vegetable or chicken broth to your bowl. We loved it – I got to have tons of noodles and chicken, and my husband could include pretty much everything. There was also a dessert table with cakes, truffles, strawberries and whip cream, and cheesecake. Yum! The next night, we ordered from a menu and we both chose the bacon wrapped pork served over arugula (shown above). Afterwards, we enjoyed the sundae bar. I felt like a kid choosing all of my toppings. The waitstaff and dining attendants were very friendly and helpful. We really liked the woman at the dessert table and sundae bar. She seemed like she enjoyed her job and was joking around with us. Make sure to look for my second post about the Pocono Palace couples resort where I’ll share all of the activities they provide. Have you ever been to a couples resort? Do you think you’d like to go to the Land of Love? What a great experience! I would love to get away with the hubby... but I don't want to leave the kids, so we look for family adventures! I will be tabbing this, though. I grew up vacationing in the Poconos and would love to get back! I haven't been to the Poconos in years! What a blast from the past. I totally agree! My problem is my relatives will not take my kids overnight or well ever. So I have no sitter and can't afford to hire someone as a nanny. Alone time is definitely important, but we'll settle for date nights every couple of months. This looks so romantic! I'm totally jealous. You'll have to put it on the back burner for when they are old enough to stay on their own! I love the Poconos! We have not been back there for years though, this would be a great way to stay for us if we get a chance to take a vacation without the kids. So romantic. My husband and I have not had a date night in 9 years. I would so love to go here WITH NO KIDS!!! The No Kids Allowed aspect is awesome! It is so neat to walk around and only see couples - couples holding hands, couples at a nice dinner, couples at the pool... It is really quiet and relaxing. That heart shaped pool is awesome! I need to book something like this as a long over due honeymoon! Looks like an amazing place. I am really loving that heart sauna. So cool and romantic. This place looks great. I am adding it to our list of places to visit. 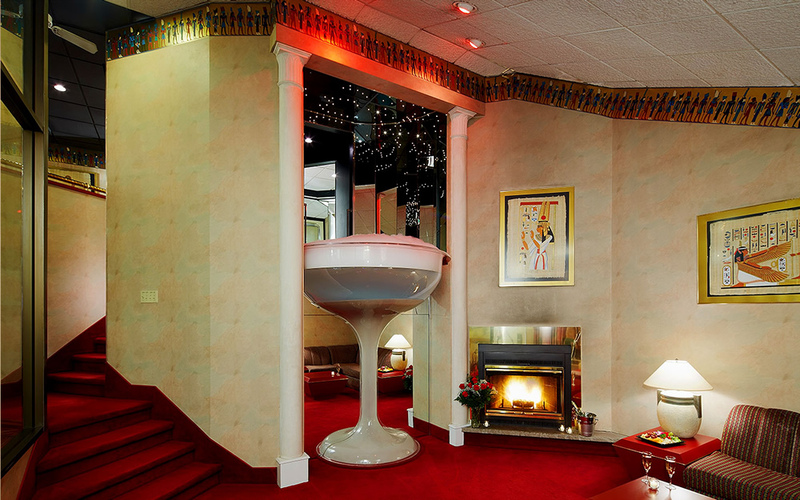 I have stayed at Pocono Palace many many times. We love it and will continue to visit as long as we can afford it. I am so glad you enjoyed it as well. My husband and I stayed at Cove Haven in June 2014 and CANNOT wait to go back. Planning a trip in January. I have seen alot of complaints on the "tacky" out-dated decor, we loved the "old-time" feel. You want glamour go to New York. You want romance and togetherness and these resorts are for you. No distractions. I totally agree, Stephanie! I think the decor adds to the "couples only" aspect of the resort. oh to be on that lake right now. everything looks amazing. My husband and I are lucky because we only live a few short hours from here and we try to go a couple of times a year. We always look forward to it and never want to leave. Wow. 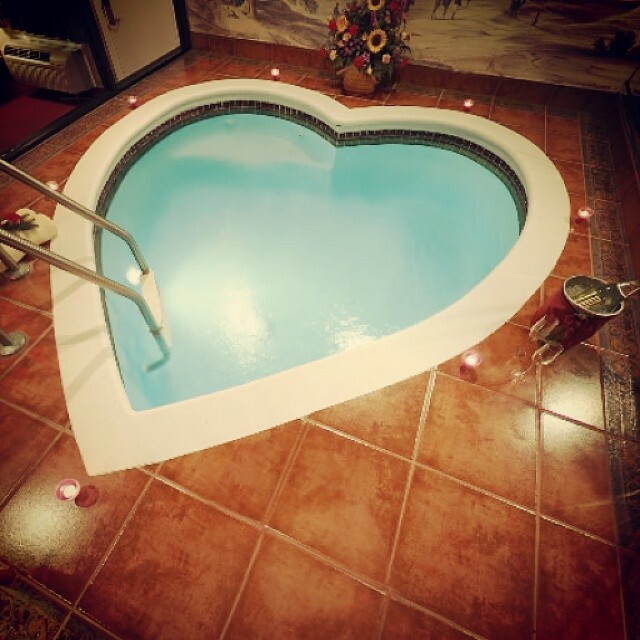 This looks like an awesome Valentines Day spot. Definitely, Brandon! Wish we were headed there again this weekend!